A small perennial shrub that reaches about 2’ and possibly up to 3’, ‘Indian’s Grey’ nightshade needs low to moderate water and embraces a spectrum of light conditions, from full sun to part shade. It was discovered in the Santa Lucia Mountains of California and is noted to be a shrubbier, denser form than than the original variety, as well as boasting more flowers. 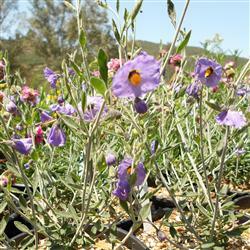 ‘Indian’s Grey’ nightshade flowers prolifically in spring and summer, with lots of lavender purple blooms with yellow centers clustered on silvery limbs with leaves of blue green. It has a compact, mounding form, and would be an excellent addition to gardens for native birds, as the flowers turn to shiny black berries in fall. This deciduous native likes well drained soil, but is adaptable in its soil preference, tolerating alkaline soil and clay. Try it on banks and dry borders, or anywhere you’d like a splash of color!